(in case of Windows 7) specific for the current user. As to me, it was the origin for subtle errors when I tried to update my MiKTeX installation. Going to Start, All Programs, MiKTeX 2.9, the menu shows Maintenance and Maintenance (Admin) as submenus. I thought I could ignore Maintenance and only use the Update (Admin) utility from Maintenance (Admin). It appeared however that the packages installed on-the-fly are not updated by Update (Admin). As a result, updated packages sometimes conflicted with non-updated packages. This especially is a pity since experimental packages, such as l3kernel, l3packages, fontspec, polyglossia, unicode-math, sometimes conflict even if they are all updated [I have this case right now!]. So my question is: What is the best practice for installing and using MiKTeX? I am the only user on all my computers, but I used to accept the default method of installing MiKTeX (for all users) since once I tried to install MiKTeX in the for me only mode but met some troubles (don't remember exactly which ones). If you choose "Install missing packages on-the-fly: Ask me first", MiKTeX will ask you each time whether a package should be installed for all users or only for you. 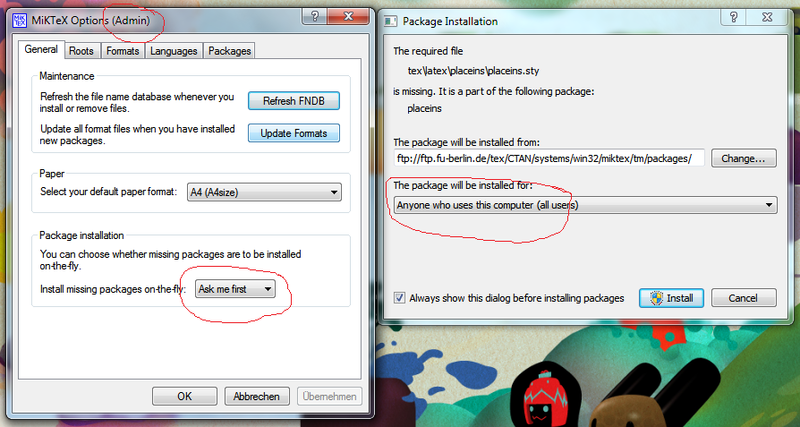 That way you can install all packages into the main MiKTeX admin folder. I'm always installing a basic MiKTeX in my user account "only for me". This works fine even if the user account has only restricted rights. There is no need to give this user admin rights or something similar. I simply log-in in the user account and install MiKTeX. Naturally the main texmf tree must be installed in a folder where the user account has the right to write. Imho a single user installation is the best for a lot of people. Many don't understand that in a multi user installation user settings can overwrite admin settings and that quite often you must manage your installation as admin and as user. About 90% of problems with map-files e.g. are due to misunderstandings regarding user/admin settings. I'm using the basic installation because it is faster (some packages like cm-super can take a lot time to install), when I upgrade I prefer to import all the other packages from the previous MiKTeX on my machine. Also there is less danger that the download or installation fails if the connection breaks or if one package is defective. At last: a basic installation keeps the list of packages in the update manager short as I see only updates for package I actually use. I mainly use Update(Admin) but from time to time use the package manager to clean installed on-fly packages from my user folder and install again as admin user those which I want to keep. Not the answer you're looking for? Browse other questions tagged packages installing miktex best-practices updating or ask your own question. colortbl conflict with tabular parbox?